One question that we are asked about once a month involves digital scales for weighing cats and kittens. Customers have learned over the years to visit our site and look for low price pet scales, so it’s natural that this would be one of the products that folks would be interested in. The best veterinary scales for weighing cats are often smaller counter top scales. They don’t necessarily have to be what you would call a true veterinary scale, like the Weighsouth VS-2501 for example. A lot of times customers who are looking to just weigh their cats will choose a smaller digital scale or perhaps even a digital scale for weighing infants. When you’re in the initial research stage of buying a scale, it’s important to not get fixated on just looking for low price animal scales. Every month we have customers who do this and often they end up purchasing a scale that is not quite what they needed. Often, for just a few dollars more, they could have purchased a scale that would meet their requirements. If you have questions, contact our customer service department and we will work to get you the answers that you need. Now let’s look at what we consider the best veterinary scales for weighing cats. As mentioned earlier, often when customers are looking to exclusively weigh cats, a veterinary floor scale is a bit too large. However, smaller traditional size vet scales can work pretty well for weighing cats and kittens. Animal hospitals and veterinary clinics often praise the LVS 700 performance and value, making it one of the best veterinary scales for weighing cats. 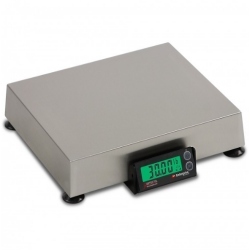 The scale features a 38″ x 20″ easy to clean stainless platform. Its remote display with large Backlit LCD gives easy viewing. The display can be used on a desk top or wall mounted with the included hardware. Its large 38″ x 20″ weighing platform is large enough for some Lamas and Alpacas yet small and accurate enough for the smaller breeds of dogs and cats. The Brecknell PS500-36S digital animal scales offer a convenient, compact and portable weighing capability. This durable product offers unparalleled weighing performance, with the advantages of low profile and affordability. Great for Vet Clinics looking to weigh cats. Standard features include lbs, kg and lb/oz weighing modes, weight hold feature, stable weight indication and auto power off to extend battery life. Operates on four (4) AAA batteries or AC adapter (both included). Also included is a rubber slip reducing mat, an indicator bracket for stand or wall mounting, and a RS-232 cable. PS500-36S comes with a stainless steel top, allowing for easy wipedown. Not legal for trade. Detecto VET 70 compact digital veterinary scale features a brushed stainless steel platform for long-lasting durability and easy wipe-down cleaning after animal weighing. The scale weighs in .02 lb / .01 kg increments up to 70 lb / 31 kg, yielding precision results for small animals, such as cats, dogs, and rabbits. The plug-in AC adapter and lightweight build allow for easy set-up and mobility. These are what we would consider the best veterinary scales for weighing cats. When it comes to weighing your small animals, these digital scales are designed to provide you with years of accurate weighing. Please contact our customer service department if you have any questions. Thanks for your business.